This film is a particular example of Disney’s recent move toward more inclusive narratives that attempt to meaningfully represent underrepresented or misrepresented identities in society (in this case, Polynesian cultures). The film not only addresses important notions of individual and collective identity but also includes a nuanced character, Moana, who is willing to go against the grain and do what she feels is right. 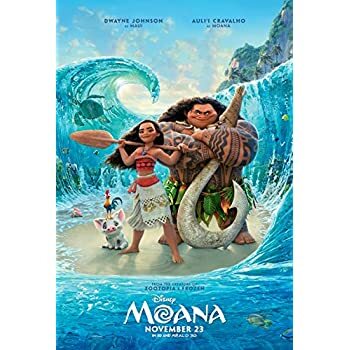 Moana, who is in line to become the next chief of Motunui, must go on a journey in the ocean to save her village from a blight by restoring the heart of Te Fiti. The characters in the film, especially Moana, do not appear to adhere to traditional gender roles regarding femininity and masculinity. While there have been a long line of male chiefs in the village, Moana is in line to become the next chief. Moana is active (rock climbs, swims, and is agile) in addition to being courageous (goes out to sea on her own), intelligent (quickly learns how to sail), and kind (treats others with respect). Moana’s grandmother, Gramma Tala, uses a walking stick and is aware that people think she is “the crazy old lady” of the village. Rather than be strictly used for laughs like so many other characters with disabilities or old-bodied characters in media, Gramma Tala acts as the primary site of strength and encouragement for Moana as she is able to see the bigger picture regarding Moana’s capabilities and destiny. Disney’s “princesses” or main female characters are usually depicted as unrealistically slender, white, and largely inactive in order to be considered beautiful or of value. However, Moana challenges these constructions as she is of color and capable of physical activities that require strength and agility but is still constructed as beautiful. Oftentimes in the media, people with tattoos are portrayed as deviant. However, in the film, tattoos are tied to identity and pride. For example, Maui’s tattoos (which are animated) depict stories of his life, and Mini Maui, a tattoo version of Maui, often acts as Maui’s conscience, encouraging him to do the right thing. It is important to note that many critics found the depiction of Polynesian bodies in the film to be problematic because it refers to the stereotype of Polynesians as overweight. However, criticism is especially associated with Maui because Disney’s depiction does not adhere to Maui’s description in Polynesian narratives. As mentioned, Moana is an example of Disney’s recent move toward more inclusive narratives. This is an important step in terms of visibility of non-white, non-European cultures in Disney films but also raises questions about cultural commodification. In the film, Disney attempts to inch toward authenticity by representing aspects of Polynesian cultures and including voice actors who are of Polynesian descent. However, Disney ends up combining and altering traditional Polynesian cultures in the process. For example, many people have been critical of Disney’s depiction of Maui, an important figure in Polynesian mythologies. In order to understand what some audience members who identify as Polynesian thought of the film in relationship to the representations of Polynesian cultures, please click here. It is important to note, because the film takes place thousands of years ago, narratives about European colonialism are avoided. Also, because Disney’s representation takes place many years ago, this can perpetuate the notion that Polynesian cultures are static or have not taken multidimensional forms in present day. For a critical analysis of Moana in relationship to cultural commodification and colonialism, please click here. The film engages with a dilemma experienced by many people whereby they are forced to choose between doing the “right” thing or acting in accordance with the wishes of loved ones. For example, Moana’s father, Tui, forbade Moana from going beyond the island’s reef. Despite Tui’s rule, Moana understood that she must go beyond the reef in order to save the village even though this meant disobeying her father. There is also a larger theme concerning the treatment of the earth in the film.Te Fiti was a goddess with the power to create life. Maui, for praise and approval by mortals, stole Te Fiti’s heart. As a result, Te Fiti became Te Kā, a lava monster. Without a heart, she became destructive and this caused the blight in Moana’s village. Rather than try to hurt Te Kā, Moana leads with empathy and gives Te Kā her heart back so that she can be Te Fiti once again. This narrative is a reminder that we should treat the earth with respect and that the endless extraction of natural resources can cause destruction.